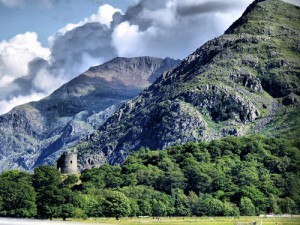 Llywleyn Fawr built the castle in the early 13th century and it was one of the last defenses of Dafydd ap Gruffydd–Llywleyn Fawr’s grandson–in 1283 after Edward had defeated Llywelyn ap Gruffydd, Dafydd’s brother (Paul Davis, Castles of the Welsh Princes, p. 42). It was then abandoned. A visit to Google Earth reveals that the Castle sits on a crest above a slight valley, overshadowed by the enormous mountains behind it. ‘The site is a narrow outcrop of rock with steep falls on all sides, especially the east, where there is a sheer drop to Llyn Padarn’ (Adrian Pettifer, Welsh Castles, p. 33). It is likely that some kind of Roman road passed through the area on its way into the mountains, as traces remain of a temporary Roman camp further up the road, once it turns east to Betws-y-Coed. According to Pettifer, the keep at Dolbadarn, which is the most well preserved piece of it, ‘vies with the gatehouse at Criccieth as Llywelyn the Great’s finest piece of castle architecture’. All three floors had fireplaces and toilets, even the basement. The outer walls were high enough to conceal the roof of the upper floor and protect it from being fired by missles (Pettifer, p. 34). 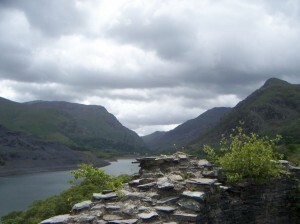 Llywelyn ap Gruffydd kept his elder brother, Owain, at Dolbadarn, for 20 years, before he was released in 1277 as part of the Treaty of Rhuddlan. An old man by then, Llywelyn provided for him the cantref of Llyn, in which he died sometime before December, 1282 (Smith, Llywelyn ap Gruffudd, p. 441).